BAGHSAR, Kashmir — The Pakistan army spokesman, Lt General Asim Bajwa rejects Indian claims of surgical strike that resulted in death of two Pakistani soldiers. He briefed journalists near the spot where the incident took place, whereas India had earlier claimed they had flawed a terror attack plan through a surgical strike. Lt Gen Asim Bajwa, DG ISPR [Photo from ISPR video]. 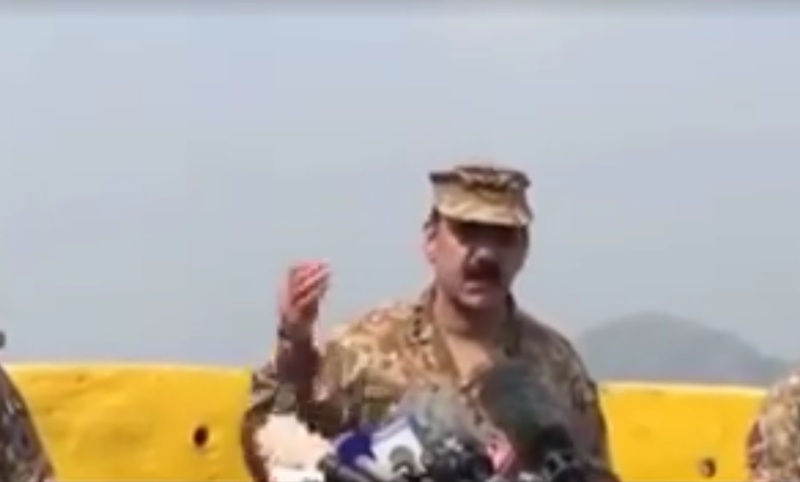 “They came that safely and downed their forces, and went back?” asked Lt General Asim Bajwa, while briefing journalists on the spot at Line of Control in Kashmir. “It was another lie, and then they told about paratroopers, we all know about this that paratroopers come from above to the ground, then how those paratroopers went back?” asked the Pakistan army spokesperson in the briefing. “After these ‘lies’ they (the Indian army) claimed that our special forces entered the region for the strike. And launched this action and came back”, told Bajwa. “All the units on Line of control have come back from war on terror. The whole world has known about their capabilities”, Bajwa added. While rejecting the Indian Army claims and stating them “lies” Bajwa told “Come and do cross a soldier of the Pakistan army”. The Indian army and government fabricated these “lies” to satisfy their public told Bajwa. On the flip of this the Indian army official DGMO Lt Gen Ranbir Singh told, “The Indian Army conducted surgical strikes at several of these launch pads to pre-empt infiltration by terrorists. The operations were focused on ensuring that these terrorists do not succeed in their design to cause destruction and endanger the lives of our citizens”. Singh added, “During these counter terrorist operations, significant casualties were caused to terrorists and those providing support to them”. Later Pakistan’s envy for the United Nation, Maleeha Lodhi had confirmed that the Pakistan army arrested an Indian soldier alive on Line of Control. Media houses in both Pakistan and India have focused the current movements on Line of Control. ArmedPolitics contacted Dr. Altafullah Khan, analyst and media expert who is head of Journalism and Mass Communication Department at the University of Peshawar.